A day that starts and ends with two cafes and two golf courses, with rolling sheep-filled hillsides between. Flock art, unexplained turkey legs and a monument to a Victorian railway baron. 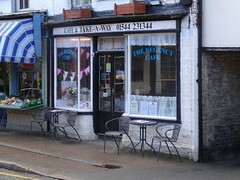 The day began at the Regency Café for another one of their magnificent breakfasts. By the time I’ve finished eating and a little writing as I eat, it is already almost 10 o’clock, but as I resolve to make some progress for the day, I spot footprints on the wall in the old covered market. Going in I found a display for the Kington Walking Festival, and also there is another wall display of development plans for the town, starting with a risk assessment of the High Street (narrow pavements and dangerous crossing points), with a series of options from one-way streets to complete pedestrianisation. If they opt for the latter I sincerely hope that they do not end up with those soulless ersatz red flooring bricks, but something in keeping with the area … it could even end up even more like a 16th century street, although possibly dispensing with dodging slop buckets from overhanging upper storeys. There is also a stall for the Kington Historical Society including maps for sale – copies of beautiful hand-drawn maps of Kington and a number of nearby places. I cannot resist, although it breaks my heart, and that of the lady selling them, to fold them to put them in my rucksack for the day. However, the other one of the two ladies at the stall gives me a tip: put them between sheets of greaseproof paper she says, then iron them. It is a trick she has used herself when re-using old Christmas wrapping paper. I buy a number of their booklets, including one about the old tramways that I’d heard about the night before at The Tavern. Later in the day I find some tram tracks crossing the road outside Old Byrfa – apparently coming from nowhere, leading nowhere. One of the booklets is about Kington people, each vignette written by a different person. I notice the authors sometimes share surnames with the historical figure they write about; families of the area, undoubtedly a few going back as far as the wood-framed buildings in the town. The path cuts north past the old town cross. 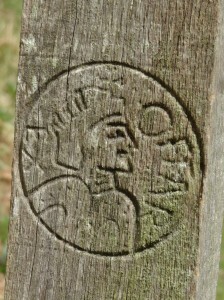 I see a woman cradling a baby; a building, now a house, with ‘National School’ in faded lettering cut into its gable; a different woman searching for her lost black Labrador; and, as the way begins to cut across grass paths between the scattered outlying houses of Kington, a small ivy covered shed window with two old lamps as if they were there to light travellers along the way. Leaving the last straggling houses behind I see a warning sign ahead, at first I wonder whether some part of the Brecon firing ranges extends out to here, but then realise it is the Kington golf course and the danger is from flying golf balls, not incoming missiles. 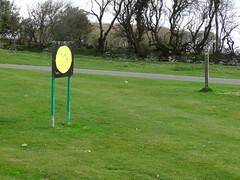 However, as I cross the golf course there is a black metal sign with a large yellow circle painted on it, pock marked by air-gun pellets … I try to work out whether this is its purpose, or whether it is for something else entirely and the shooting practice the result of a drunken night out by local youths. 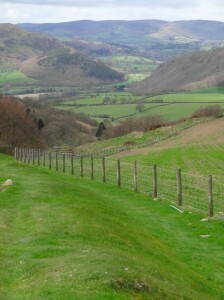 Offa’s Dyke is more evident this day than many others, a lot of the time either following along its top, or beside it, taking a meandering path, usually passing just below hilltops, except once, towards the end of the day, marching straight across the top of the impressively named hillock "Pen Offa" (Offa‘s head or Offa‘s hill top). 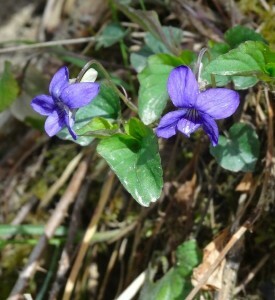 During the day it was also clear that spring has belatedly come! As well as the ubiquitous Welsh daffodil, I see the grey-blue new growth on tips of fir trees as if spray-painted on the dull dark green of their old growth, beneath one tree I hear the hum of bees, and, later, spot a sole bee drunkenly drinking at a celandine. 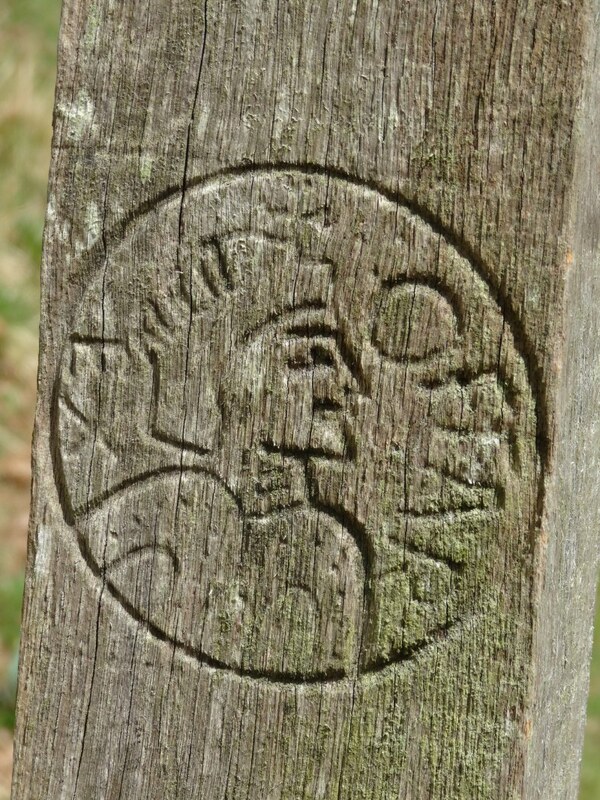 In Llandogo the landlady regretted that I had not seen the Wye Valley woods filled with bluebells, but now, two weeks later the bluebells are out along the path-side, and although most of the deciduous trees are still bare, the odd bronze-brown leaf is breaking through. 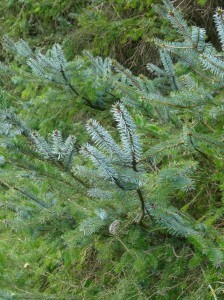 I will see the flow of the seasons in a way I have probably never done before. 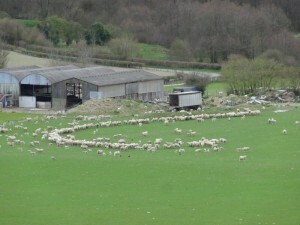 Not all nature was perspicuous, from a distant hillside I saw a flock of sheep in a field form a perfect ‘C’ shape. 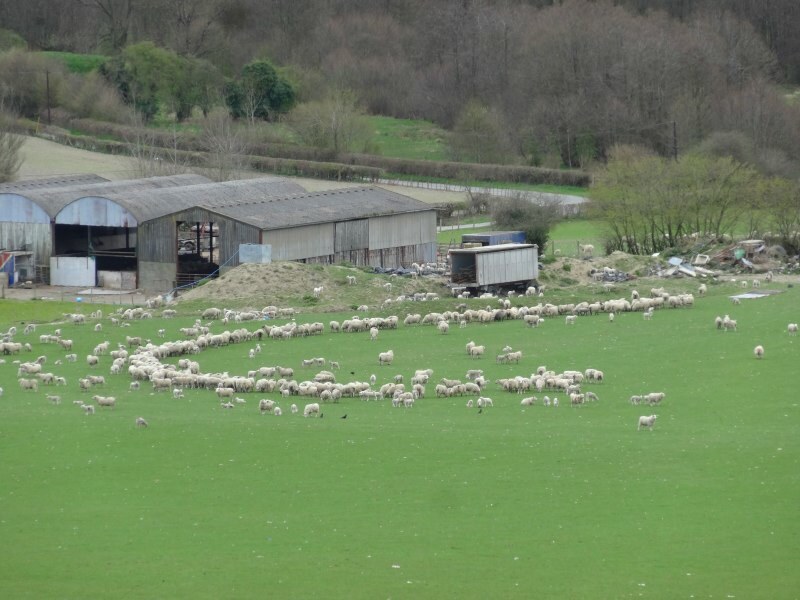 It seemed like they were forming messages for extra-terrestrials, or perhaps a sheep deity, but I guess more likely that the farmer had driven in a rough semi-circle when distributing food. More confusing were two turkey feet, entirely stripped of flesh, a few yards apart. I know that chickens can sometimes run around after their head has been severed, so I wondered if this were an extreme example, two disembodied (as in chopped off from their body!) turkey legs running across the fields, until, over a mile from the nearest farm, the toes suddenly realise there is no body or blood and finally keel over. More prosaically, I guess a carrion bird could have been raiding a kitchen bin. 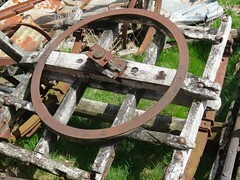 It was also a day of old farm machinery or at least my photographs are full of them: abandoned harrows with their repeating geometry, the near final remains of a broken and rotted wooden cart, its wheels barely more than hubs with a few radiating spokes, a Fergie tractor in a shed, with oil-shiny engine, and clearly still in use, and an abandoned X-reg Renault, its paint still shining in a dark turquoise green, although its glass is broken and tyres decayed. Also old buildings, some classic picturesque stone barns, but also ramshackle corrugated iron sheds that look as if they would crash down in the next puff of wind, and one that clearly had already. So, the picturesque stone barn and 1950s harrow would be seen universally as beautiful, possibly the ramshackle barn, but probably not the old Renault. 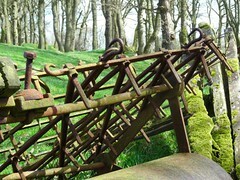 But the rusty harrows were once shiny painted, maybe an eyesore when first abandoned. 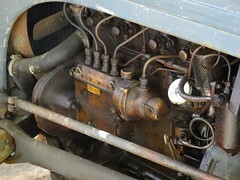 The countryside is by its nature untidy, feed sacks and oily engines as much as bracken and bird song. 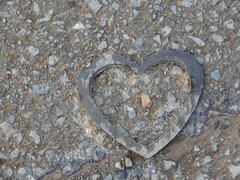 And, on the stony path at the edge of Kington Golf Club, an old rubber gasket lies in the shape of a heart. Perhaps there is a difference though. In the past a harrow would have done far more years’ service than the now rusting Renault, the weight of waste of modern life is far heavier than in days gone by. In the Antarctic, expeditions have to carefully pack up all their waste and return it by boat when the sea-lanes are open. Maybe we should do the same, maybe fill our graves with all the things abandoned during our lives, rather like the ship burials where they took goods for the life to come in Valhalla, the life we have left should follow us. The Tavern in Kington was the old railway tavern, but before that served the tramways, and further back simply an inn. The things that seem solid of iron and steel, the icons of their day, pass so quickly. 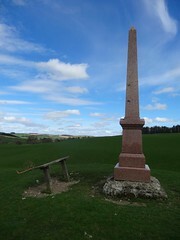 Just before the final approach into Knighton, perhaps 30 yards from the path, is a small obelisk on the hillside. Drawing closer I see it is a memorial to Richard Green Price, a Victorian railway baron (indeed actually made a Baronet), who built the railway to Knighton amongst others. I later learnt that this was predominantly about getting agricultural produce to the Midlands markets, and that Price had launched and managed a public subscription to get the railway built for the benefit of local business. Unlike Kington, Knighton Station survived Beecham, and is a lifeline for the town, with trains to Craven Arms and links to the mainline in one direction and all the way down to Swansea in the other. The Kington station is sorely missed, buses are infrequent in this part of the world, if you have no car you have few options. Even in Knighton, I was told that villages just outside the town may have only one bus a week, rather like when my family and I lived in Skirwith on the edge of the Cumbrian Pennines. We had a car, but for those that did not there was a once-weekly bus that gave you two hours in Penrith, or a three-mile walk to the next village. Mirroring the start of the day, the last stretch takes you between woods to the left and the Knighton golf club to the right, the greens built improbably level against the sloping hillside with high railway sleeper retaining walls. 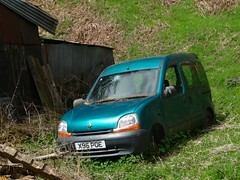 Then, through the woods, you catch the first glimpse of Knighton through the trees. 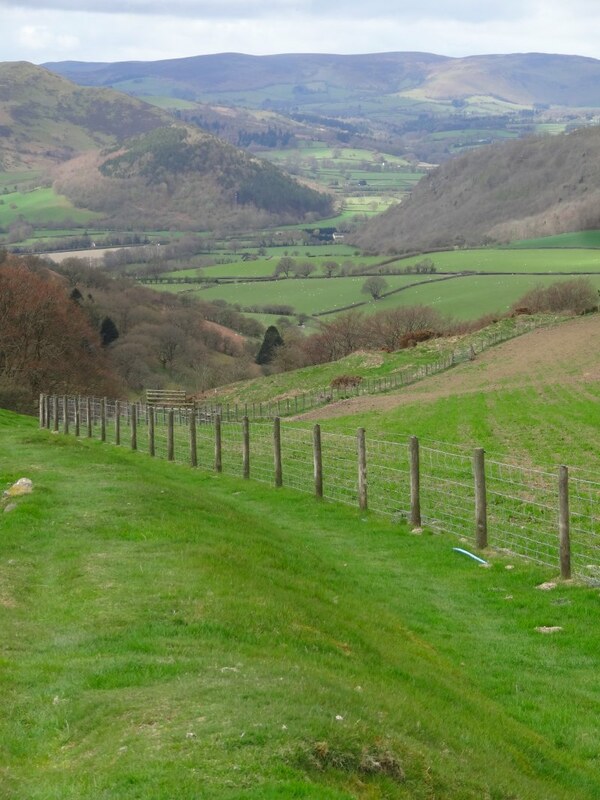 Whereas entering Kington takes you back 500 years, the edges of Knighton are more like green suburbs of any city, post-war and recent estate housing. As a town it must have grown substantially in recent years, but it is not clear what industry drove this, maybe commuter belt to larger towns to the east. However, beyond the modern estates the old church and market clock are visible and beyond them the steep wooded hillside (tomorrow’s journey) rises dark and somewhat forbidding beyond, like a dark dream, held back by the stone bastion of the old town, but reminding the modern semis that they, like the railways and tramways before, are ephemeral. I thought the day was nearly over as I came into Knighton town centre, through the back of the Knighton Hotel, under its old coach archway into the main street. The George and Dragon, where I was staying, was only fifty yards to the left, but, as I walked up the street, I glanced into a passing tea shop window and saw walls piled high with books, higgledy piggledy, on shelves, in piles. I had to go in. 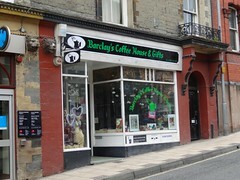 Barclay’s Coffee House and Gifts is run by Jo, originally from the Philippines, and Richard from South Africa (at least I think he is Richard, there were so many jokes about names and family, I lost track). It turned out Richard is an ex-chef, and when they first came to the area they had worked together for a local dame (I forget her name, which is just as well), who faulted everything they did. The job included accommodation, which was good, but after a while the constant criticism got too much and so around a year ago they started the café. The stories of life sort of ‘below stairs’ reminded me of Elizabeth West‘s ‘Garden in the Hills‘, follow on to ‘Hovel in the Hills‘, which tells about a couple who left their jobs in Bristol to buy a tiny Welsh hill cottage. At one stage money got tight and so, for a period, they would answer ads for live-in cooking, cleaning and handyman duties, even though that took them away from their beloved cottage and garden. They are books I have read and re-read as I longed to do the same, but have not read for some years now … however, they are in my camper van library! The premises had once been a caf&eacute, but then, for some years, it had been a charity shop until Richard and Jo took it over. The decoration is eclectic, hops hung over the windows and archway, fairylights and bric-a-brac … and of course second-hand books. The books are mostly popular novels, sold on a buy it, but sell back for half price, a sort of library model. There were ones that caught my eye, but I loved just sitting and drinking a pot of tea with so many books around. When I first went into the shop, I started talking to a lady on the next table about walking, and then onto my walk. I could see another lady on the table beyond half leaning to hear, so when the first lady left, a fresh conversation started with the next lady, who it turned out is a close friend of the youth hostel manager at Kington. Finally I ended up chatting to Richard, Jo and a number of regulars in what became a sort of evening soirée. The café isn’t licensed, but every so often someone popped across to the supermarket for a four pack. After a while Jo disappeared into the café kitchen, there was a sizzling sound and a short while after she re-emerged with sort of open-toasted-sandwich-cheese-burgers … delicious. After two hours of discussion ranging from the local domino circle to Philippino IT education, and three cans of beer, I eventually finished my 20-yard journey to the George and Dragon.